What fun! My stamps arrived Friday. 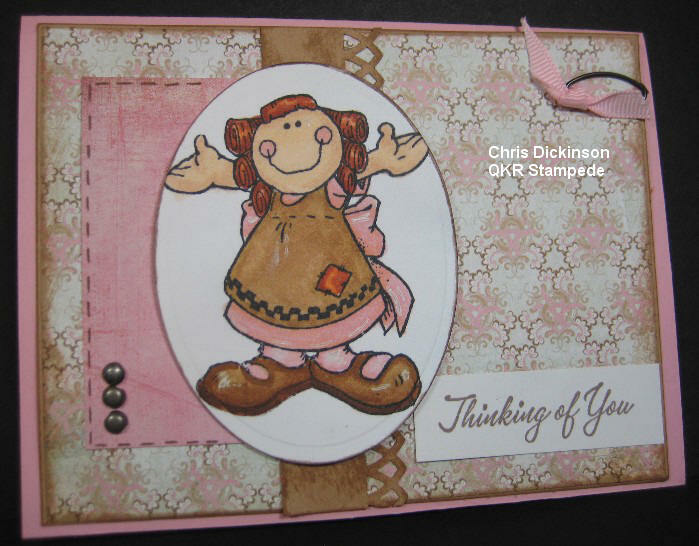 Well, I have several of my new stamps stamped and in various stages of cardmaking, this is my first one done to photograph and send. 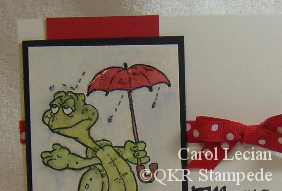 I stamped this fellow on navy paper that I had painted with a fine red glitter. I embossed him in white and it really looks like he has worked up a profuse sweat from being in the sun! Then I matted him and the saying on yellow pearl bazzil paper, then on 2 different plaid papers on a white card. You can almost see the glitter and it is a fun fun fun stamp. Tonight I hope to watercolor him and do something less traditional. Hi Everyone and happy Tuesday! It is Jessica here...I am so excited to be able to share with you today. I am so excited to be a part of this new Design Team! If you haven't stopped by the QKR Stampede Store yet...you really need to! There are so many awesome stamps to choose from! 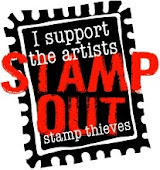 I love stamps...well I will be the first to admit that I am a bit addicted to stamps...ha ha. I started stamping back when I was in high school. I still have most of my stamps from "back in the day", although I don't use them as much as I probably should. I took a little stamping break between college, getting married, and having my first 2 children. When I was pregnant with my 3rd child, I went with my mom to a SU party...and well...I now have an entire room in the house filled with stamps, paper, ink, and all sorts of embellishments. In January this year I set a few goals for myself...my first was to become a part of a design team, and the second is to be published. Well, I am half way there! I am just thrilled to be a part of a design team for such a great company too. 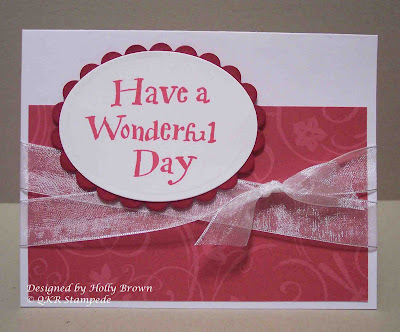 Well enough about me...I have a card to share with you today. Here is a little close up of the flower centers and the glittery petals. Aren't these flowers soooo cute! I just love cutsie images. I did some paper piecing with the pots and the flower faces, and colored the stems with marker. Have a great day! And be sure to check back often to see what the other DT members have to share with you. Like a Kid in a Candy Store . . .
That is exactly how I have felt this past week. Carol, here, with my first post as a QKR Design Team Member. I am so excited to have been chosen for this adventure. A quick couple notes about me before getting to what you really want to see . . . I live in northeast Ohio and have been crafting all my life. 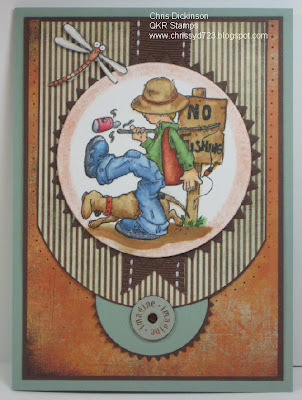 I have stamped for many years, but was bit by the stamping bug in 2001 when invited to a stamping party; so, I say that I have been stamping--officially--since 2001. Each technique led me to wanting to learn a new technique, take a new class . . . and, well, I'm sure you know how it goes from there. Fast forward to 2010 . . . I became a fan of QKR Stampede on Facebook, saw the post seeking design team applicants, applied, and here I am. This week has been a whirlwind week for me, from finding out I was chosen to be a Design Team member, to picking out images to work with (where to begin! ), meeting the other Design Team members, and thinking of/planning card and project ideas. I was really excited that my stamp images came in the mail yesterday and I started playing right away! I picked three turtle images from the vast selection because, well, those turtles are just too cute! And tonight I am showing you one of them. 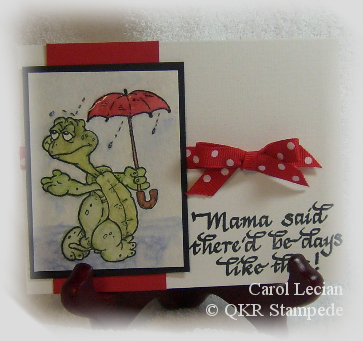 The card I am sharing uses the In the Rain and Mama Said stamps. These images are perfect for anyone who loves coloring; I chose to watercolor this little guy. I added crystal lacquer to the umbrella to give it a bit of dimension and to make it look "wet" from the rain. At least this little guy had an umbrella with him; I can't even begin to count the number of times I've been caught in the rain without one! I hope you enjoyed this initial preview . . . there's a lot more to come from many talented ladies! Thanks for stopping by! Hello friends! This is Chris Dickinson from Wisconsin, popping in to share a card! I know the Design Team is anxiously awaiting their images from QKR Stampede so they can get started! So in the meanwhile, I thought I would create a cute card using the THIS MUCH image. 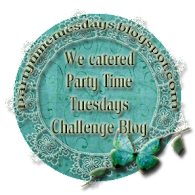 Are you a Challenge Junkie like me? 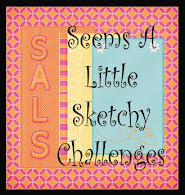 I love challenges of every kind and find lately I have become addicted to them!!! I sit down to create and look at my stamps and think, "NOW WHAT?" Then immediately look for a challenge! :) With that said, this card uses TWO challenges, Splitcoast Stampers Color Challenge for this week was to use Pale Pink, Caramel, and Dusty Durango (rust) and then I used the Belli Challenge Blog which offers a Sketch and the challenge to use CLIPS! 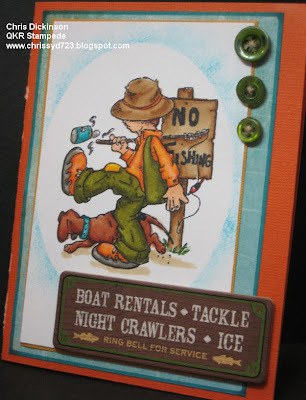 Normally, the Belli Challenge is a challenge blog that is to use up your embellishments that you have lying around. This week they added a sketch too. It is a lot of fun! We are so excited to share our NEW Design Team with you! Please welcome the following talented Paper Crafters to the Team! Be on the lookout for some FABULOUS work from these ladies! Have you seen all the wonderful images from QKR Stampede! There is something for everyone there! So many styles and sentiments! I am just popping in to share some more details on the Design Team Call. The deadline to enter for the Design Team will be this coming Sunday, March 21 no later than 7 pm MT. which translates to 6 pm Pacific, 8 pm Central, and 9 pm Eastern. This will be a 6 month term - with an option to continue if it is agree-able to the Design Team member and Maribeth. ~You must be able to follow instructions on time and work well with others. ~Check out the participants blogs and comment please. ~Post your work to other Forums you are participating in and comment in those areas too. ~ You MUST have a blog and be posting regularly. We are still working out a few more details and will share those requirements with you as we know them. Anyone interested in applying can email me atmaribeth@eurekastamps.com. Maribeth will contact those chosen early next week and we are planning to have the Design Team start on APRIL 1. Welcome to the QKR Stampede Blog. We know that right now the blog is pretty bare bones, but we will be adding to it as we go along! For now though - we are excited to announce that we are doing a DESIGN TEAM CALL! Anyone interested in applying can email me at maribeth@eurekastamps.com. No deadline set yet -- we are still on an as-it-happens schedule. We will let you know MORE details as QKR Stampede decides! Thanks so much for stopping by! We look forward to sharing MORE with you and seeing your creations too!